Homeowners are usually concerned about a number of things when it comes to generators. Having a backup for the power in your home is very essential. It will save you a lot of stress and cost, should there ever be a power outage. 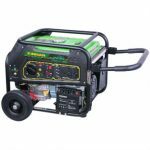 While users are debating about price, functionality and even the quietness that a generator has, another concern for these generators is the type of fuel that they run on. There are different benefits to using either regular gas or liquid propane. Both have their pros, and have their cons as well. Therefore, choosing a generator for your home based on this concern may be quite tricky. If this has been a concern for you, not to worry. 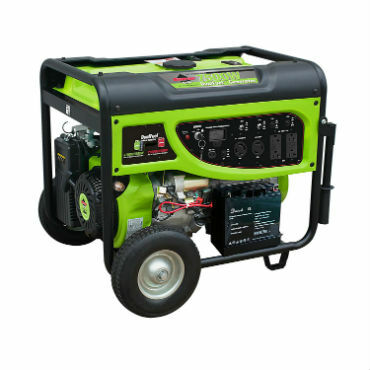 It is possible to buy a dual fuel generator that is able to run on gasoline or liquid propane. In this article we will be taking a look at the top dual fuel portable generators on the market, and providing you with all the information needed to buy the best dual fuel portable generator for your home. 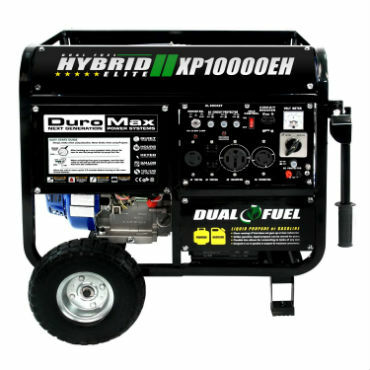 The DuroMax XP10000EH is one of the best dual fuel generators out on the market today. It brings a lot to your home in terms of efficiency and functionality. When it comes to power supply, there are few portable generators on the market that come close to it. This generator has the capacity to give your home 8000 running watts and 10000 starting watts, which is very impressive. It also has dual fuel capacity, allowing the generator to either run on gasoline or liquid propane, depending on which the user prefers. If for some reason one fuel form is unavailable, then you can easily switch to an alternative. 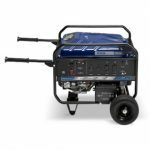 Gasoline is usually scarce in cases of emergency, so this generator brings you the option of switching to liquid propane should you ever be faced with this problem. 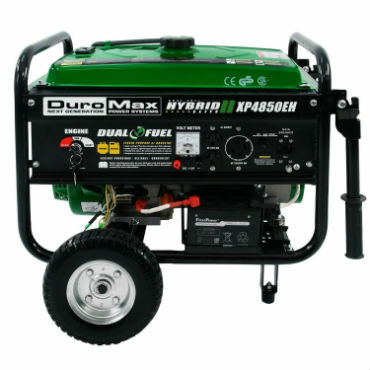 The engine strength of the DuroMax XP10000EH generator is also something that impresses a lot. 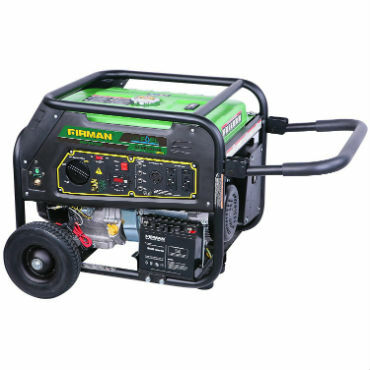 It has a very strong 18HP engine that can easily power all the electrical equipment in your home. With this generator, you don’t have to turn off some Televisions and air conditioners, because it is strong enough to carry all high wattage loads. Since it is portable and can be moved around easily from place to place, it is very useful in different applications. If you want it as a standby for your home or when you are going out for the weekend with the RV, this generator is able to serve both purposes. 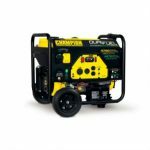 You can get as much power as needed from the DuroMax XP10000EH generator through its multiple 120 volt receptors, giving the user the choice between 120V and 240 simultaneously or just 120V on full power. It also has low oil protection, which ensures that the unit turns itself off when it is running low on fuel. It also has a spark arrestor, bringing much needed electrical safety. It has an electric start system, and a recoil start system, depending on what the user prefers. This dual fuel generator from Duromax does not supply as much power as the XP10000EH, but it still comes with a lot of functionality for the user. If your power needs are not that much, the Duromax XP4850EH portable generator can help to supply much needed electricity to your home. It has an electric start system, which a lot of users prefer to the recoil. Recoil generators are usually much harder to start, but this generator simply requires that you turn the key in ignition for it to come on. It is very portable and it comes with a handle bar and tires, which will allow the user to easily whisk the generator to areas where it is needed. If you are having a small party at your backyard, then this generator would be very useful. You can easily wheel to where you want and return it when you are done. In terms of performance, the Duromax XP4850EH portable generator has a 7H engine that is very durable. With proper maintenance, the engine of this generator can last for a lot of years. It is also air cooled, and makes use of the OHV technology that a lot of generators are using today. It has a heavy duty exterior, which show you just how rugged the unit is even from its appearance. It has four different motor mounts that allow the generator to run smoothly and operate quietly in your home. The Duromax XP4850EH generator has different AC outputs; one being 3850 watts and the Max output being 4850 watts. This generator also comes with a power panel, and an oil warning light that tells the user when the unit is running low on fuel. It uses a key to start, and also has a circuit breaker and voltmeter to indicate levels of power output. It automatically turns itself off in low oil situations, and it is approved by the EPA for use in national parks. Are you looking for a small and portable generator for home or outdoor use? The ST-GP7500SDEB generator is one of the top editions from Smarter Tools out on the market. It is very portable, and can be moved from one place in your home to another. 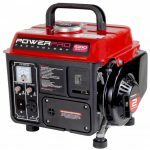 This portable generator also comes in very handy if you are out exploring the outdoors with your RV. It has immense power for its small size, and it uses two different types of fuel. 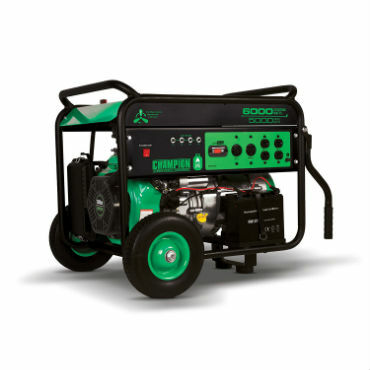 This generator can run on either regular gasoline or liquid propane, depending on which is available. This is a very useful feature because sometimes gasoline may be scarce and you will need an alternative. The Smarter Tools ST-GP7500SDEB generator has the capacity to supply a home with 6200 running watts and 7500 starting watts, which is more than enough to power up all the electrical equipment within your home. It has an electric start system, which is more preferable to the recoil, and it comes with a 12V 71Ah battery which is rechargeable. In terms of efficiency and fuel consumption, there are few dual fuel portable generators that come close to this unit. It is capable to work for up to 9 hours efficiently with a 50% load on just 6.6 gallons of gasoline. Despite all the functionality that it brings, the Smarter Tools ST-GP7500SDEB generator still manages to be efficient with fuel. It also has reduced noise levels, with a rating of 72dB, you will not have to worry much about the noise coming from the generator. This means that you can place the unit next to your home or RV without worry about noise. It is approved by the EPA, and CARB, which have strict regulations in some states. You can easily switch between gasoline or propane by flipping a switch. It is also quite affordable. Strong, sturdy and reliable. These are the words that come to mind when speaking about the Champion Power Equipment 71330 5000 watt generator. The strong metallic design and smooth finish all show just how rugged this generator is. It is one of those units that you can use in your home for years. With proper maintenance, there is no need to call for repairs or to replace this generator. It offers a lot to the user in terms of power supply, and it is a viable source of electricity should your home ever experience a shortage. The Champion Power Equipment 71330 generator is capable of supplying a home with 5000 running watts and 6000 starting watts, which really impresses for a unit of its size. It is portable and comes with a set of wheels and a handlebar that will allow the user to move it easily from one place to another. It also has a set of carrier bar, just in case you need to lift the unit. This generator uses either gasoline or liquid propane depending on just what the user wants. This is very essential, because the availability of either propane or gasoline should not mean that you don’t get to use your generator. It has a strong OHV engine and it is powered by the Champion 389cc engine. It is made from cast iron sleeve which further adds to the all-round durability of the unit. In terms of fuel efficiency, this generator is quite impressive. It is able to run on a full tank for 8.5 hours at 50% load. In terms of pricing, this generator is not off the mark. It is a good option for those buyers who are not looking for something too pricey but still want the best out of a generator. It weighs 193.6 lbs and comes with a 2 year limited warranty. Regular Gasoline or liquid propane? Which to choose? 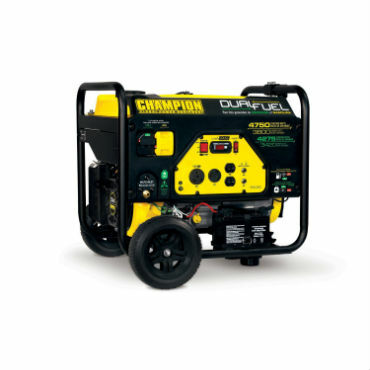 The 76533 generator model from Champion power equipment allows any user to easily switch from gasoline consumption to liquid propane with just the flip of a switch. It does not get any easier than that. This generator is very portable, and it comes with its own set of wheels that give balance to the generator, also allowing the user to move it from one place to another. This is a great feature because if you want to use to generator for a get together, you can simply move it near the power outlet that you will require it for and get all the electricity that you want. In terms of performance, the Champion Power Equipment 76533 generator brings a lot to the table. It has the capacity to supply 4750 starting watts of electricity as well as 3800 running watts which is able to carry all the load that may be present in your home. It can run for 9 hours on a full tank of gas and can extend to 10.5 hours if you are using propane instead. The engine of this generator is sturdy and reliable. Its 224 cc Champion engine will last any user for a lot of years without developing a fault. It also has a low oil warning indicator, and shuts itself off when oil levels are low. This is done to prevent damage to the engine. It also runs on a push to start system, and has a battery included when you first buy the generator. It has multiple outlets for power, and they are all secured by Volt Guard. This would help to protect all your household appliances should you experience a power surge. The Champion Power Equipment 76533 generator also comes with free lifetime technical support, and a 2 year limited warranty. Small but mighty. This generator is small in size and extremely compact but it will surprise you with the features that it can bring to your home. You can decide to use regular gasoline with this unit or liquid propane. All you have to do is flip the switch to indicate which fuel you are using, and your generator will run effortlessly. It comes with a handle bar and a set of tyres that further enhance the portability of the unit. This makes it easy for the generator to be whisked away should you require its use somewhere else. It also comes with a handlebar that allows the user to lift the generator without stress. In terms of power supply, this generator performs quite well. The Firman RD9000E generator supplies 7500 running watts and 9350 starting watts to your home, which is more than impressive. It is deceptively powerful for its small frame. It also offers a lot in terms of low fuel consumption. This unit will run for 9 hours on gasoline and 9 hours on propane if the tank is full, with a 50% load. Its oil capacity is 37 ounces and it also comes with an auto shut-off mechanism that allows the unit to automatically turn itself off if it is low on oil. When it comes to starting, this generator provides options for the user. You can choose to use the recoil start system, but it also has an electric start system. The propane tank for this generator is however not included, so you may need to purchase that separately. 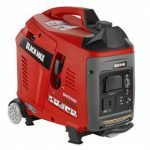 While this may not exactly be the cheapest generator out in the market, it offers way more than its competitors in terms of performance. It is also very durable, and comes with a 2 year limited warranty. Affordability: Being the best doesn’t necessarily mean that it is the most effective. In fact, the best units usually are efficient in terms of pricing. 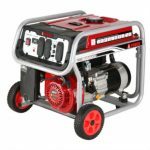 You should therefore be on the lookout for a generator that does not require that you break the bank, but still offers you the best in functionality and efficiency. 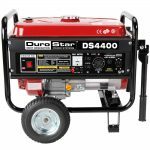 Our top dual fuel portable generators rated in this review are quite affordable, and should save you a lot of money. Fuel Efficiency: You don’t want to buy a generator that requires you spending a lot on gasoline or propane on a monthly basis. A good dual fuel generator should be economical, and must be able to save you money on fuel consumption. The average fuel consumption that you should be looking out for is 8.5 hours on a full tank with a 50% load. If a generator offers you less than this, it probably isn’t economical. Never be afraid to ask questions or read extensively through the manual. Durability: A good dual fuel generator should bring immense durability to your home. A generator should have a lifespan of up to 6 years if it is maintained effectively, and sometimes even more than this. For engines, you should look out for the Horsepower that it is supplying, as this would determine how much load that the generator would be able to carry for long periods. OHV engines are also preferable. You must also be on the lookout for your starting watt and running watt requirements. Different homeowners have different requirements, so you should be sure of what you need before buying a unit. There are a lot of dual fuel portable generator reviews on the market, but few of them would analyse them so objectively. In this review, we have outlined 6 of the best dual fuel generators out in the market today. Each of these generators bring a lot to your home in terms of performance and durability. The dual fuel feature is one that a lot of homeowners are looking out for nowadays. This is because the price of gasoline usually fluctuates, and sometimes there may be a scarcity. Therefore, it always helps to have a number of alternatives. 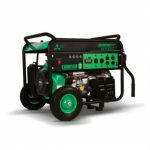 If you are looking for an affordable dual fuel portable generator, then our review has provided you with some of the best. These generators are portable and can be wheeled anywhere that you would desire. Engine performance and watt capacity are some of the things to look out for in a generator, and each of these generators performs well in terms of those criteria.